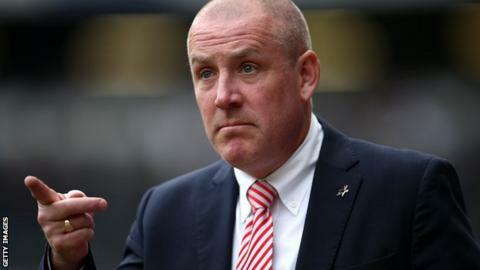 Brentford boss Mark Warburton says he has to make sure that any summer additions will improve their squad. The Bees won promotion to the Championship on on Good Friday. He told BBC London 94.9: "We will look to add some quality as and when it is required. You don't want to replace people for the sake of it. "We have a very good squad here with a lot of young players and great senior pros. If we can strengthen in a certain area, we will do." He added: "You are always looking to improve every area. "It is important for us to recognise what we need to do in the next division, how we adapt to it and how we make a strong impression in that division." Brentford have not been in the second tier since 1992-93 and chief executive Mark Devlin says the club will need to make several improvements around Griffin Park in order to comply with Championship regulations. "Getting promoted early just means we have given ourselves an extra fortnight to get some additional planning underway," Devlin said. "There is an awful lot of work to get done behind the scenes. "There are changes required at the training ground and lots of rules and regulations the club have never been exposed to. We have got to improve our media area and our floodlights. "There are improvements we have to make and improvements we want to make. "Although Griffin Park may only be our home for two or three years we want to make it as welcoming to supporters as possible." The Bees have announced there will be an increase in season ticket prices. "We have got to generate more money with Financial Fair Play rules to adhere to, though they might be changed during the summer," Devlin added. "That needs to be balanced against trying to use our promotion to the Championship to increase our fan base and entice new supporters to come and watch us. "It has been done with common sense and everyone would recognise the prices have to go up. It will allow us to invest in the squad and compete at a higher level."